Every month we will be celebrating one of the 2017 Iowa Character Award recipients. 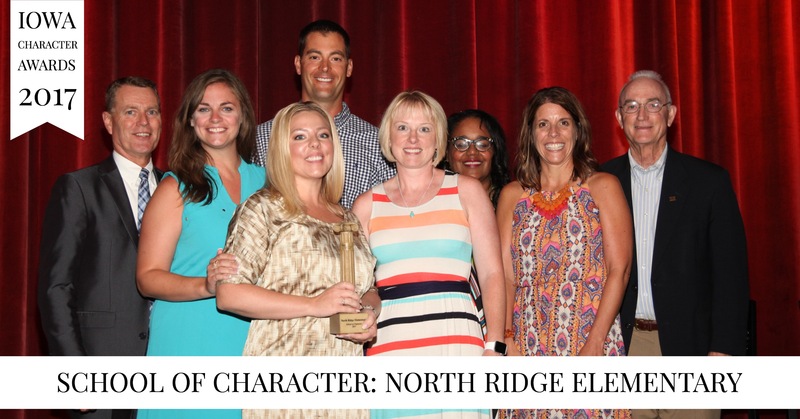 This month we’re celebrating North Ridge Elementary School, the 2017 School of Character Award recipient! North Ridge Elementary in the Dallas Center-Grimes Community School District shows good character every day by respecting others and demonstrating citizenship. Serving 650 K-5 grade students, the team of 65 team members focuses on providing an excellent learning experience and teaching good character skills to help their students be successful in life. Walk the halls of North Ridge and you will see the Six Pillars of Character displayed proudly throughout the building. The students and staff of North Ridge Elementary enjoy being active in the community. They have raised over $8,000 for the American Heart Association and Jump Rope for Heart, led a food drive for the local food pantry, and hosted a fundraiser for the Special Olympics among many other community service activities. North Ridge Elementary was rated by the state of Iowa as a High Performing School in 2015 and a Commendable School in 2016. Students lead Character Assemblies each month focused on one of the Six Pillars of Character. This past year, a 3rd grade class ran a school election during the Presidential election and focused on citizenship. Take a look at North Ridge Elementary School’s award video here!